Welcome to the garden this week. I am safely snuggled in the snow on the mountains, waiting to pounce an unsuspecting chippy. We are finally beginning to have lovely weather, mum is sitting outside with me lots on the patio. This week to wrap up June we will concentrate on our roses. These were here when mum got here and they just come back each year. The one by the back has been attacked by something. Lots of broken canes and then the flower on the ends don't bloom. Mum isn't sure what has done this, she is thinking the squirrels as the are too heavy and break them. They are looking to pounce to the bird feeder. In the front by the side of the house is this red climbing rose, peeking out over the ferns. Then a little pink rose bush off to the front and side of the yard. Little pink flowers and lots of them this year. 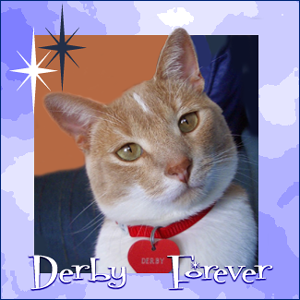 It was nice to see so many of you this week as you stopped by for Ducky's purrthday. We had fun. Today I am 3 years old, now hosting my second ever purrthday party. I didn't get to have a purrthday party when I was one, my beans at the time didn't cellybrate with me. Come on in, get some good eats, drinks and lets visit. 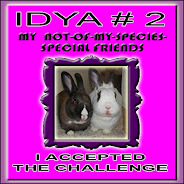 You can have your favorite beverage, age appropriate, niptini's, meowgarita's, blue tuna gizzy, champagne. Milk and tuna juice for the younger group. 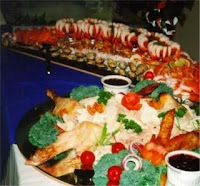 Lots of foods on the buffet table to snack on too. Ham, chick-hen, real live dead shrimps. Little nip cakes to finish off your meal. Have fun everyone! It was a nice weekend, lots of open windows, finally some sunshine and nice breezes. We hung out for a while together in the front window for at least a couple of minutes. Mum was around doing her normal weekend chores, but on Caturday morning this pick-em-up truck back into our driveway, Mum went out to talk with them and they left this with us. Mum got a new outside cooking thingy. Guess the old one wasn't working as well as it could have and mum figured she might as well replace it with something good. She bought it at a store that put it together and delivered at no additional charge. Mum said it saved her hours of time and headaches. Looks great mum, what are you going to cook for us? Yes we see you just sitting outside, reading a book, fix us something nice to eat. Oh yeah, that is what we are talking about! A nice good size piece of not yet roasted beast. A couple of slices for mum to eat, the rest went into the big cold box to eat at another time. Mum's plate with meat and potatoes. You gonna eat all of it or do we get a taste? Yeah, we got a taste. BTW, stop by tomorrow and wish the runt a happy purrthday. Refreshments and noms will be served. Hello and Happy Garden Thursday. Virginger here with a short and quick tour of the garden. It has been cool and rainy here this past week. The garden is sort of between the spring stuff and the summer stuff. The one pee-o-knee not fully bloomed and some pink columbine off to the left. Our one and only poppy flower that we got this year. It didn't last long with the rain either. Mum says she needs to move the poppy plants. The daylily plants have over taken them so you can barely see them. The boys are doing well inside. I see mousies and such out here, but we just let each other be. Outside is space we can all share. See you all next week for Garden Thursday. We got us a mousie! I, Ducky, found him this morning in the dungeon. I brought him up to show mum, he was squeaking lots. I put him down near mum, and the mousie ran behind some furniture. Mum had to go day hunting, so she told us to make sure we deaded him while she was gone. So we did. Derby giving him a sniff. Me taking one last look before mum picked him up. Mum put him in the empty pizza box and took one last picture. Bye Mr Mousie, you don't come mess in our house. We will dead you. HiYa, Ducky here. We had a wonderful weekend. Mum was home doing the normal chores, it was nice and we had lots of open windows all weekend long. But we didn't want to do too much working ourselves. We napped, including mum for a while. While Derby zonked out on mum's bed in the middle of the afternoon. We did lots of fevver watching too. Mr Oriole stopped over twice on Caturday to eat from the jelly feeder, the hummer birds were by too to snack for a bit. Plus it is fun to watch the baby robins. While they are flying pretty good, they are still following their parents around, looking to be fed. And the parents do feed them. Pretty soon they gotta learn to find their own worms! Hope off of you have a good week! Hello, happy Thursday. Virginer ready and waiting to show you around this week. We are a bit late in posting as we wanted to keep our purrs for Precious up longer. The pet-unia boxes are doing well on the front of the house. They get lots of sun and mum makes sure they get water if we don't get any rain. But we have had lots of rain. Then by the front corner of the house we have a jungle of ferns. Mum swears they went from not being up to wow in less than a week. Not much else happening right now in the garden. More next week. Bye. 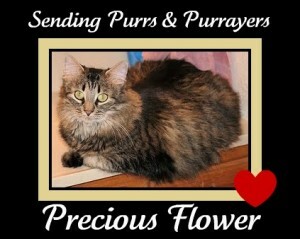 Our little furiend Precious Flower is having emergency surgery. Her tummy troubles have continued. No yak and I guess no poop either. Get better please little girl. OK, who mussed the sheets? Hi everyone, hope you had a good weekend, we did. Mum of course was home with us since Thursday. As she said catching up on all sorts of stuff, including sleeps! On Caturday evening she went to bed before the sun went down! Said she was all tired and just wanted to rest. But she woke up just about on time on Sunday morning. I, Ducky, then jumped up into bed with her and cuddled for a while. Made her stay in bed longer. She caught up with book reading, using the grass eating monster, the laundry shuffle etc. But since it wasn't that warm outside she didn't sit outside for very long. After the hots last week it got all cool and rainy, so mum hasn't had the windows open much. Wants to keep the heat we have in the house, inside the house. Later this week we will have warmer weather and more sunshines. Mum did grill outside on Sunday evening, but since it was cool, she came inside to eat. We got to have some of her chick-hen. Also got tuna and ham this weekend. Sending lots of purrs to our lovely little lady furiend Precious Flower (aka Squirt). She is having all sorts of tummy trouble and we hope she gets all better soonest. Woohoo, happy weekend! We are all excited the weekend started early for us. Mum didn't go day hunting on Thursday or Friday. She has stuff to get done so bopped around doing that on Thursday. The Friday she and Miss Lynn went places for a while. Miss Lynn even stayed for a while and visited. There was a super nice piece in the paper today about those who are all working together to help feral cats and to keep them from making babies. You can read all about it here. It went and got all cool on us now too. We had rumbly rain storms on Wednesday night and we even had the lights go out. Our neighbor the electric company fix it guy had the power back on for us in just a little bit of time. Thanks Chuck. We will be napping and snuggling this weekend. Have a good one. Hello everyone, Virginger here. Hope your week is going well, mine has. With the nice weather mum is spending more time outside with me! I like that, she did some outside work to make our patio prettier last weekend. I figured I would hang out in the crabby apple tree for a while and stay out of her way. The hots are here, at least for a couple of days. Mum took this picture when she came home from day hunting. Ninety after 5 PM and in the shade. The hot weather is moving our flowers along, where they seemed so slow, now they are catching up. White pee-o-knee. Mum says this one always looks the best, full, lots of flowers. Thanks for stopping by, see you next week.